USFSS is proud to announce the 2013 Wild Card qualifying races. These events will be held in regions across the US. In the event any or all of the races are cancelled, the remaining US Team slots will be selected based on an applicant’s qualifications. However, each region will have at least one additional selection per event. In the case of skidog events, 1 women and 1 man will be selected because in a WCh men and women race separately. The classes will be: 1 dog skijoring junior, age 17-20; 1 dog skijoring; 2 dog skijoring; Junior 4 dog, where a 4 dog is not offered we will use 3 dog, but the racer’s age must be 14-16; and 4, 6, and 8 dog sled. Where an 8 dog is not offered we, we will use a 10 dog class to determine selection. Because of the limited number of open races in the lower 48, ALL additional open class slots will be selected based on your qualifications. We apologize for this, but there was no way to make it fair, without asking you to drive all over the country. If you have already applied, your application will automatically be considered. You will need to have your USFSS dues current. The additional open slots will be selected on January 9, 2013. The rules to make the team are simple. Place higher than anyone else who has applied for selection, who is currently not on the team. There will only be 1 additional selection per region, per event except in the case of skidog, which is explained above. ALL interested qualifiers must be USFSS members by January 7, 2013. You will also need to submit an application for entrance into the IFSS WCh. Both these forms are on the www.usfss.org. There will be No exceptions to this rule. We need to know in advance of the race, who is participating to earn a berth on the team. It’s with great honor for USFSS to announce our 2nd round selections to Team USA. We thank all of you for committing the time and resources to this WCh. We have an awesome team, and we still hope to add to it. USFSS realizes there continues to be controversy surrounding this WCh with regards to dog care and doping control. Rest assured, USFSS nor IFSS intends to put dogs at risk nor make doping control more than it was intended to accomplish, keeping dogs safe and humans from enhancing performance. Thanks again, see you all in North Pole. Once again, congratulations to all of you. A race packet will be sent out shortly with hotel, airfare and other logistical information. There will also be list of approved animal care products, information on where to review the prohibitive substances for both dog and human and a TUE exemption form, both dog and human, if you need it. You will also receive a race uniform order form. We will work closely with you through this process. Don’t hesitate to contact us with your questions or comments. If you would like to volunteer your time to some of the preliminary work activities, let us know. Thanks for being on the team. It’s with great pleasure and honor for the US to announce Round 1 selections to the US team. We were privileged to have such an awesome group of athletes to choose from. IFSS was gracious in allowing Team USA to select all applicants we determined to be the top athletes in their class. In some events, we made all 6 of our selections, in other events we will wait till round 2 before making our final selections. As you can see, there are still opportunities to apply in some events. If you’d like to be considered for Round 2 selections, your application must be received/postmarked by October 1. We are still hoping to offer the Wild Card races this winter, but that will be contingent on number of slots the US still has available, and whether we can plug into the ISDRA race circuit. Congratulations to everyone selected in the 1st round. Team USA truly appreciates your willingness to commit the time and resources necessary to compete against the best Sleddog racers in the world. Once again, congratulations to all of you. A race packet will be sent out shortly with hotel, airfare and other logistical information. Due to changes in IFSS antidoping concerns, USFAA requests that each team member refer to the link on the IFSS website: http://sleddogsport.net/index.php?option=com_content&task=view&id=103&Itemid=69 to keep up with the antidoping requirements for the world championships. Specific requests can be made to USFSS and our antidoping board members will work with the IFSS antidoping committee to help resolve them. You will also receive a race uniform order form. We will work closely with you through this process. Don’t hesitate to contact us with your questions or comments. If you would like to volunteer your time to some of the preliminary work activities, let us know. Thanks for being on the team. North Pole Economic Development Corporation, the WCh RGO, has asked the USFSS board to extend the application deadline. Last night the USFSS board approved their request. The application deadline will be extended to October 1, 2012. Out of fairness to the applicants who submitted their paperwork prior to the original September 1 deadline, MUSA will make its first 3 selections for each event out of this pool. The applications received before the September 1 deadline that were not selected, will become a part of the next round of selections. The good news is this extension will allow more of you to participate in the WCh. We do expect there to be additional slots made available to the US because of our willingness to approve the extension. Once again, the 1st round selections will be made by September 21, 2012. The 2nd round selections will be made by October 26, 2012. One last thing, I have asked the new Continental Director of IFSS North America, Dave Steele, to look into the doping issue. Dave is USFSS’s new representative to the IFSS and as such, is the person responsible to take our voice to the IFSS. I know he’s looking into the proposal process to see if anything can be done to change the doping regulations before the WCh. The link on the IFSS antidoping for humans and canines can be found on this link on the IFSS website under anti doping: http://www.draghundsport.se/dbpage.aspx?PageNr=236 . Once at that site, choose Anti-Doping Regulations and Prohibited Lists. If you click on Athlete Education on the index page you will find very useful information about antidoping rules and lists. To determine IF you need a TUE (therapeutic use exemption) you can go to the website, The US Antidoping agency: www.usada.org/tue/. In particular, the link to the wallet card which describes prohibited and non prohibited substances is very useful: http://www.usada.org/uploads/2012_wallet_card.pdf. b. USFSS would like to replace the statement “You have to have a TUE for all meds” with: As a human athlete you only need a TUE for medication containing a substance on “the List” There are products which you can buy OTC (over the counter) in most countries, containing substances on “the List”, for example some kinds of nose drops which is not a prescription drug yet is on the list. You can check your OTC medications as well on the USADA website or at www.globaldro.com. If you use the globaldro.com site, you, the human athlete, will need to select a sport. At present sled dog sport is not an option. Carin Ahlstedt, the IFSS antidoping chair person, recommends selecting ‘skier’ for the skiing competitor, and ‘equestrian’ for the sled driver, as they are the closest equivalents. The IFSS TUE Committee is made of medical doctors. But TUEs can be handled by the NADO which, In the USA is the USADA. Carin has suggested that the TUEs of US competitors be handled by the USADA, and USFSS will contact the USADA to discuss that. a. All medical information and data provided by the Athlete and physician(s) involved in the Athlete’s care. b. All details of the application including the name of the physician(s) involved in the process. IFSS (International Federation of Sleddog Sports) Anti-Doping chair person. Thanks to all of you who have joined USFSS, and have become a part of Team USA. Your membership will help us finance the obligations a WCh requires of the federation. MUSA also appreciates your decision to apply for the privilege of representing Team USA at the 2013 WCh. I hope you will be able to participate. We’ll have to wait and see how many competitors are coming from the other countries. Please remember, whether you receive the right to race or not, you’re still on team. MUSA will make its first 3 selections for each event by September 21, 2012. Everyone who applied will be notified of their status. For those of you still contemplating submitting an application, you have 1 week remaining before the application process is closed. After September 1 the only way you can make the team is to race your way on in January by participating in the wild card races. (Details are in the works) This is a tremendous opportunity to be a part of something truly special. Please don’t miss out! There’s been a tremendous amount of chatter on the blogs the past few weeks, and although USFSS appreciates all the hype, we need to be certain our fears are real and not imagined. USFSS has done and will continue to do all we can to help you get through the process of drug testing, micro-chipping, transportation expenses, and all the other obstacles which might get in your way. We will have a team working on each of these issues. In May right before the application deadline for this event, I tried my best to talk NPEDC out of submitting a bid. I was not certain the United States would rise to the occasion and deliver an event that exceeded what Norway put together in 2011. I don’t like doing things half way. NPEDC made the decision to go forward, and since then Helen Lundberg from IFSS/ISDRA and all of us from USFSS have committed a lot of time and money to make this event special not only for the USA, but for all the other countries with plans to come this way. Let’s all work together to change the things we can, accept the things we cannot, and have the wisdom to know the difference. I’ve attached a correspondence I submitted through ADMA pertaining to drug testing. The debate over cheating is centuries old. One of my skiing buddies Bode Miller once said, “We should allow people to put in their bodies whatever they want if it improves the quality of the sport.” I must admit the homerun battle between Mark McGuire and Sammy Sosa was pretty awesome. 70+ homeruns WOW! But what about the people who didn’t cheat by taking supplements, which have been proven to increase performance. You, I, and the sport of Sleddog racing aren’t going to be the group of people resolving this debate. The sole purpose of IFSS is to provide a racing structure and format that may someday allow this sport into the Olympics. Drug testing is a very big part of this process. I do believe however, doping measures may need to be adjusted for the distance racing dogs. I don’t know if that’s possible for this WCh or not, but going forward definitely. Once again thanks for your decision to get on board and to be a part of something special. We are still very short on applications for Juniors, Distance, and Open events. All the best with fall training as you prepare your team for competition. I want to thank Jeff for establishing a bit of rational thinking to the discussion of doping. I know we all have the welfare of our dog athletes at heart when nursing them back to health from injury or sickness. I also know what’s really cool about Nome and Distance Sleddog sports, old people like me can still race and be competitive, but at my age, I’m perhaps taking substances that are on the banned list in order to walk, talk and get out of bed in the morning. In our element of Sleddog sports, the performance of the human athlete is not as important as it would be in Nordic events, we get on the runners and go. In Nordic events, the athlete in most cases comes back from the race more exhausted than the dogs. Hence, competitors in Nordic events would receive far more benefit from doping than competitors in sprint racing. In Distance events drugs to keep you alert might have some benefit, but the performance of the racer will usually not be as paramount as the performance of a skier in Nordic events. However, it is difficult to discriminate between events. That would open up a debate with NO possible conclusion. Within the anti-doping rules, there’s a process of foreclosure that allows all racers to indicate the drugs they are taking, and to then obtain an exemption, and yes the privacy/confidentiality of this information needs to be assured and will. MUSA has board members who will work with every selected athlete, to make certain the process and steps involving doping control measures for humans and dogs are implemented with fairness and integrity. Doping is fundamentally contrary to the spirit of the sport. I realize all of us follow this code to the letter, but this gives athletes from around the world the assurance that establishing fair play is important and necessary. Unfortunately, the spirit of cheating is rampant in most sporting events today. One of my heroes, Lance Armstrong was just stripped of all his acclaim. Did he or didn’t he? The people with the knowledge to know said YES. In baseball cheating has been a part of the sport forever, you steal bases and signs, but there’s something fundamentally wrong with artificial production. I don’t think we’ll ever have every athlete clean, but until we decide it’s OK to cheat, don’t we want to provide assurances to the non-cheaters that were doing everything we can to ensure fair play? Please don’t let your medical routine get in the way of competition in the WCh. There are provisions within the process to deal with your circumstances. I realize it’s an uncomfortable process. I know I wouldn’t want my current prescriptions disclosed to the general public. If you apply to race as a representative of Team USA, your privacy will be protected, and we will work with you through the process. Whether Sleddog sports finds its way into the Olympics or not, the concept of fairness should be pursued in ALL areas, especially within events involving competitors from all over the world. This helps remove the doubt that cheating has occurred. A WCh should not be just another dog race, or we are doing a lousy job of marketing an event that would help us standout. Thanks for expressing your concerns. Discussion leads to the truth. You may still not agree with the anti-doping rules, however I hope you have a better understanding why IFSS has implemented them into the organization. I have heard from many of you over the past few weeks with questions and comments about the upcoming 2013 World Championships. I feel compelled to address answering your questions and conveying your comments to a larger audience. I truly hope the following information will help you make the right decision concerning your MUSA membership and application to the 2013 WCh. First of all, how awesome the past couple of weeks have been watching Olympic athletes from all over the world compete for their countries in the 2012 summer games. I marvel at what these awesome athletes in so many different venues can do. I can’t wait for the day when Sleddog sports find its way into the hearts and minds of a larger audience. The majority of questions and comments concerning the WCh have been about selection. How do I make the US team? MUSA is honored to have so many of you desire to race for Team USA. During my racing career I participated in 3 WCh. Each of the 3 opportunities had different selection criteria. My first 2 WCh selections we’re earned on the race circuit. MUSA had developed a series of IFSS sanctioned races in the Midwest, the winter before the WCh, which I raced in and won. I earned an automatic berth. The 3rd time was 2005 Dawson City, Yukon. My first WCh in 1995 in Lake Placid, NY was memorable, but disappointing. I expected more than a top 10 finish. My 2nd WCh in Fairbanks was horrendous. The team I took up to Alaska, was not the team I qualified with. A lot changes in 1 year. My racing partner Josh Kooiman ran the hot team, and did very good, top 10 finish. I finished next to last. Worst race I ever ran, almost earned the red lantern award. The 05 WCh was absolutely awesome, all good memories and a 5th place finish. Why am I telling you about my WCh race history? It helps illustrate the difficulty associated with selecting a team. I earned the right to be on the US team based on the criteria MUSA followed back then, but my performance at 2 out of 3 WCh was not very good. I don’t think there’s a perfect selection process, but I promise we will do our best to make team selection unbiased. We will look at mph, quality of competition, race conditions, race location, anything and everything available in order to select the most deserving applicants. It will be much harder to make the US team this year. The quality and competiveness in our sport is unbelievable. As of now the classes with the most applications are the Nordic events and the Nome 4 and 6 dog. We need Junior, Distance, and Open applications. The only way you will be able to race in the WCh, except for ONAC and Two Rivers, is to apply and be selected. Please don’t make your support of MUSA and the WCh about whether you do or don’t make the team. It’s about all of us involved in this great sport getting behind our country. I have really enjoyed the camaraderie fellow Olympic athletes have demonstrated towards each other at the summer games. We’re counting on you to help MUSA accomplish what Team USA accomplished in London. I’m going to say this again, we are going to be as open minded as possible when judging your applications. We will look at your entire resume of races, not just IFSS or ISDRA races. We do not want the selections to be popularity or politically motivated. There will be some extremely competitive classes because of the number of applicants, and some difficult decisions are inevitable. It’s like when you show up for the drivers meeting of a race, and you look around or go through the start sheets. There’s usually 4-5 racers you think could win, but we only have 3 slots. Hopefully we will obtain at least 6, and hopefully 9 slots per class. Going forward with the wild card races in January will help us finalize the team, and provide everyone who was not selected an opportunity to make the team based on race performance. We haven’t worked out all the details, but it will be important to have races in as many regions as possible. I’d like to provide as equal of an opportunity as possible to everyone still competing for 1 or 2 slots. ISDRA and MUSA will work together to ensure a fair process. The only thing I can assure you is we’ll do the best possible job, but as hard as we try it won’t be a perfect system. Some of you will be disappointed. Hopefully by the time another WCh opportunity comes to town, we’ll have a better selection system in place. The final point of clarification has to do with the ONAC and Two Rivers events. In order to race for Team USA you will need to be a MUSA member and fill out a race application form. No different than any other class in the WCh. If you are selected to represent the US you will comply with the same requirements all the other classes adhere to such as team uniforms, team meetings, drug testing, dog chipping, promotional obligations, etc. etc. If you are not selected to the US team, you can still be a participant in either race by simply paying your entry fee and complying with the normal standards of each race. When ONAC and Two Rivers agreed to host the open and distance races for the IFSS WCh, they didn’t want to limit participation to just IFSS entries out of fear there would not be many entrants from other countries. As of right now, we don’t expect that to be a problem with the other classes. ONAC and Two Rivers race will be no different than in the past, except the racers in uniform will be representing their respective country and be racing for gold, silver or bronze. In closing, we are going to do everything in our power to make this WCh special, and not only for those individuals selected to the team, but for the entire sport. As a collective group of dog racers, we will all benefit by the exposure our sport receives. If the WCh succeeds, I hope all of us can take some credit for how this event impacted the future of Sleddog sports. If it fails, all of us will have to take some credit for that failure also. If you’re not in the team pulling the sled, you’re probably in the dog box wishing you were. This is your WCh, let’s work together to make it a good one. Thanks in advance for all you do. MUSHING USA, MUSA, is proud to announce the application process for the 2013 World Championship in North Pole, Alaska is now open. All events will take place in the North Pole/Fairbanks area and be held February 22 through March 17, 2013. A tentative schedule of events and race dates is listed here on the MUSA website. This schedule is subject to change, but will give you some idea when your race(s) will be held. It is quite an honor for Team USA to be the host country. A tremendous amount of work went into planning for what will be a spectacular event. A special thanks to NPEDC for their effort in developing an awesome proposal and to IFSS for recognizing their ability to carry out this event. MUSA will do whatever we can to assist in the implementation of this WCh so you the musher can enjoy a truly great experience. This WCh will offer races in all recognized Nordic and Nome classes. Both sprint and distance race categories will be offered. Separate classes for Registered Nordic breed will be offered for all categories with awards. There will be junior events in both Nordic and Nome classes, and separate men and women Nordic events. All applicants must be MUSA members. You will need to submit your $25.00 membership fee with your application. Animal and human drug testing will take place in all events. All dogs will need to be micro chipped. MUSA is looking into the possibility of having on site chipping available at the WCh. We will know the details of this service by early fall. We anticipate the cost of chipping to be around $10.00 per dog if we purchase bulk. If you would like MUSA to offer a chipping service, indicate that on the application. In either case, it will be the participant’s responsibility to have their dogs chipped. The cost of entry (entry fees) will be determined by the IFSS by September 15, 2012. All applicants selected to the US team, upon notification, will have 15 days to send in entry fees to MUSA or forfeit their selection to the team. The deadline by which to submit applications to MUSA will be September 1, 2012. There will be a 1st round selection of 3 US team members per class by September 21, 2012. A 2nd round of qualifiers (number of qualifiers to be determined based on other country entries) will be selected by October 26, 2012. There may also be an additional opportunity for WCh qualification through participation in a wild card race circuit in January of 2013 in all regions in cooperation with ISDRA, but the details for this potential race series has not been worked out. The racing community will be notified well in advance if we can develop this option. Prior to submission of an application please consider your responsibilities to Team USA. You will be required to wear the Team USA uniform. Attend scheduled team meetings. But most importantly, demonstrate an all for one, one for all team attitude. No matter what the outcome of the medal standings or your individual success, we want the other countries to see team USA as a supportive and cohesive unit. This WCh is not only about you, it’s about us. We hope to offer a purse in each class or racer stipend, but your decision to apply should not be based on this. We will need a successful fund raising campaign for this to happen. MUSA will put together a fair and honest selection criterion. Our decision will be based exclusively on your past performance, with special consideration given to your most recent accomplishments. There will be at least 5 MUSA board members on the selection committee. We want the integrity of the selection process to be upheld and free of any bias. In closing, I want to thank you for becoming a member of MUSA and supporting Team USA. Competing at the International level provides an experience like no other I have enjoyed over many years of racing. The best of the best from around the world coming together to determine an individual and country winner. It’s an awesome feeling. I believe by supporting the US team, we can all win. Not everyone who submits an application will be selected to compete for the team, but if MUSA does this right, everyone who submits an application will be a part of the team. We will do our best! We’ll be paying close attention to the summer Olympic Games in London to see what we can learn. Thanks again. Please submit both your IFSS 2013 WCh application form and MUSA membership application to Mike Marsch N6510 Cty Rd G Neillsville, WI 54456. You can email applications, but membership check must be received before your WCh application will be considered. The International Federation of Sleddog Sports (IFSS) invites applications from member federations to attend a Nordic Training Camp for juniors (ca 16-22 years) and leaders in Sweden August 7–10 2012. The site for the camp is in Sandviken, 150 km from Stockholm airport (Arlanda). The camp will be dryland, for there is no snow in August in Sweden. Inspire, educate and train juniors who want to develop their skills in Nordic style. They will also meet juniors from Sweden and other countries. Inspire, educate and train leaders who can teach youngsters/juniors in their home country or region. At the camp the participants will develop an action plan for their development work in their home country or region. The focus of the camp is Nordic style, but there will also be some training in Dryland/Sled. The training camp will be carried out at an annual training camp for Swedish youngsters and juniors. The international camp will be led by experienced national leaders. The activities at the camp will be led by young leaders in training, 20-25 years old. The Swedish Federation kindly offers accommodation and meals for all participants at the camp. IFSS has allocated a limited budget for travel support for international participants. You are asked to send to Sara Vanderwood (pulka4u@yahoo.com) no later than May 10, 2012, your application. Application can be found attached and also available on the mushing USA website: www.mushingusa.org. Since the number of places is limited, the IFSS and the Swedish Federation reserve the right to limit the number of places allocated to each national member. The financial support offered by the IFSS will be announced after the deadline date for submission of the applications. Board member John Perry (Colorado) resigned his position, and the MUSA board elected Natalie Harwood (Wisconsin) to replace him. She is excited about again being able to serve MUSA. Sara Vanderwood: The canine legislation committee will gather information/resources of other affiliated groups such as national animal interest groups, AKC, sportsman’s groups, etc. to create a repository of ideas in an acceptable form on the MUSA website. This would be open to only the mushing community and not the general public. As different bills affecting our sport hit different states, the info would be available on our website. MUSA would need to create action groups that would be willing to be the “eyes & ears” at municipal and state levels, willing to contact other animal welfare groups, and able to understand the legislative process, and the difference between animal welfare vs. animal rights. Board members Diane Locotos and Amy Cooper presented their ideas for promoting MUSA. They have made several suggestions. They feel MUSA’s “brand” is outdated and needs a makeover. They suggested a new logo design and adopting MUSA’s former name, United States Sled Dog Sports Federation, which better reflects the organization’s purpose. They would also like a Facebook presence. USFSS, the national governing body of sled dog sports in the USA, held its Third Biennial Congress in conjunction with ISDRA’s annual Conference in Green Bay, Wisconsin, June 25th. The main order of business was to elect a new board. However, several other issues were discussed as well. With a mandate to elect the four officers, four Active Athlete board members (those who are currently competing), and four At-Large board members, MUSA had a nominee pool of seventeen, well-qualified and outstanding people. Sara Vanderwood has relinquished her president’s position to Mike Marsch of Neillsville, Wisconsin. However, she stays on the board as its Past President. Bud Rice (Eagle River, Alaska) takes on the job of Vice President, and Rebecca Knight (Wasilla, Alaska) fills the slot for MUSA’s Secretary. Sally O’Sullivan Bair (Monticello, Minnesota) was re-elected as MUSA’s Treasurer. Elected as Active Athlete board members were Jocelyn Bradbury (Oxford, Maine), Mike Christman (De Pere, Wisconsin), Janet Saxon (Golden, Colorado), and Diane Locotos Stewart (Ipswich, Massachusetts). The At-Large board members elected were Lindy Howe (Stockholm, Maine), Joe Fessler (Hamel, Minnesota), John Perry (Sterling, Colorado), and Jamie Spaulding (Abrams, Wisconsin). Kevin Murphy (Lino Lakes, Minnesota) was approved as the board member representing the Affiliated Organizations. These capable individuals will serve four-year terms with the exception of Janet Saxon, who was elected to fill a vacancy that expires in two years. The MUSA board also includes Amy Cooper (Holmen, Wisconsin) and Chuck Gould (Isabella, Minnesota), both of whose four-year terms expire in 2013. All board members have equal voice and vote. The Active Athlete category is a requirement from the US Olympic Committee (USOC), whose guidelines MUSA adheres to. The specific ramifications of this category guarantee that a sufficient percentage of a national federation’s governance is represented by those who are actually practicing the sport. President Mike Marsch, a sprint musher, was MUSA’s Vice President and comes from a business background (University of Denver). He is currently employed by the Wisconsin Taxpayers Association, which has given him experience with political processes and lobbying. He keeps a kennel of around twenty dogs and has competed in the sprint classes for over twenty years. Vice President Bud Rice began as a cross-country skier who took up skijoring. He has competed extensively in Alaska, where he has won many trophies and awards, in skijoring events as well in the 2005 IFSS (International Federation of Sleddog Sports) World Championships in Dawson City, Yukon Canada. He has a B.S. in Forestry and Conservation from the University of California and a M.S. in Natural Resources Management from the University of Alaska Fairbanks. He currently is an Environmental Protection Specialist in the National Park Service Alaska. Secretary Rebecca Knight is new to the board and comes with a background in distance recreational mushing and more recently in skijoring. She competed in the recent IFSS World Championships in Norway and is excited to contribute her insights and experience to a new endeavor in MUSA. Treasurer Sally O’Sullivan Bair has held this position since its inception. She also serves as the IFSS Secretary General and is the editor for the Tugline of North Star Sled Dog Club, Minnesota’s local organization. She is a product of (and retired from) the limited sprint classes, having garnered local awards with a small kennel of around ten dogs. She also serves as the chair of MUSA’s Anti-Doping Committee and is herself an IFSS-certified canine doping control officer. A graduate of Colorado Women’s College (now a part of Denver University), she is a retired high school special education (learning disabilities, remedial reading) instructor. She has completed graduate certification and work in special education, counseling, and computer graphics. Jocelyn Bradbury graduated from college in 2003. At the same time she also “graduated” to a mid-distance team of her own. She has since worked for a touring company and now runs in the sprint and dryland events. This past winter she ventured to the IFSS World Championships in Norway as a spectator and thoroughly enjoyed herself. Mike Christman loves skijoring. His goals are to compete in the next IFSS World Championships and is anxious to help others get into the sport and grow the sport for future generations. Janet Saxon has two skijor dogs in her kennel and competed at the IFSS World Championships in Norway this past winter. She, too, is interested in growing the sport. This talented athlete also skis, participates in mountain biking, road biking, and running – sans dogs. Diane Locotos Stewart is already a part of MUSA. With her Ph.D. in chemistry, she serves on MUSA’s Anti-Doping Committee. A strong competitor in skijoring and dryland events, she also has background in legal issues, especially contracts. Joe Fessler is the technology expert. This man runs at ninety miles an hour. His background is mainly in skijoring, but he also has handled for distance mushers, Blake and Jen Frekking, Minnesota Siberian mushers. He has a B.S. degree in Computer Science from the University of Minnesota. Lindy Howe comes from the Down East Sleddog Club and distance and mid-distance racing. She is a registered guide in Maine and through this avenue is able to promote our sport. She operates out of Heywood Kennel Sled Dog Adventures, offering adventure packages for ice-fishing, wildlife sightings, and photography tours. Another Wisconsonite is Jamie Spaulding. She brings to the board the Nordic purebred experience as well as the knowledge earned from an Animal Science degree from Michigan State. Her specialty is nutrition and animal husbandry. She has been active in the sport since 1997 when she was still in high school. She maintained a kennel of rescued dogs. Now she has taken on Siberians as her mainstay, competing in the sprint and dryland circuits. Affiliated Organization board member Kevin Murphy got his start in skijoring and is the past president and founder of Midwest Skjorers. Currently he serves as president of Skijor USA, a new group formed in the last year but with an impressive record, having staged the first USA Skjoring Championship in Minneapolis this past winter. He earned his college degree from Century College and an MBA from St. Thomas University. He works at Wells Fargo Banks as a wholesale technology manager. A go-getter, Murphy has spent a lot of his energy over the years organizing skijoring races in the Minneapolis area. Past President Sara Vanderwood (Oxford, Maine) saw MUSA through its formative years. She came into the sport through her mother, who owns a sleddog equipment business. Vanderwood has many trophies and awards to her credit in skijoring and currently serves as the USA representative to the IFSS council. A graduate of the University of Alaska, she now works as the Chief of Staff for the Maine State Senate. Her background in legislative issues has been a natural fit for MUSA’s Canine Legislation Committee. In other actions, MUSA passed a resolution supporting the cooperative North American Cup agreement between ISDRA (International Sled Dog racing Association) and IFSS. Dave Steele, ISDRA Executive Director, shared with the MUSA membership perspectives on the agreement and answered questions. The agreement will be in effect for one year, for the 2011-2012 season. After that, it will be re-evaluated. Skijor USA was approved by the Congress as an Affiliated Organization member with Kevin Murphy as its MUSA board representative. Such a classification is required by the USOC. An Affiliated Organization is a USA sports organization that has programs in mushing. Other examples might be NCAA groups or any of the armed forces, should they initiate programs in sled dog sports. Other discussions focused on the IFSS Dryland World Championship in Borken, Germany, in early November and the MUSA Committee on Canine Animal Rights Legislation. Amy Cooper will handle any application from USA teams that wish to compete in Germany. Pete Curtice, distance musher from Michigan, submitted his committee’s outline to tackle the animal welfare bills that plague almost every state legislature and many local municipalities. MUSA is seriously considering a National Championship in 2013 or 2014. A prospective sponsor has stepped onto the scene, but plans are sketchy at present. Various aspects of such an event were discussed. MUSA was able to complete all of its business on Saturday, allowing attendees to participate in ISDRA’s program. Mushing USA congratulates its new board members and looks forward to some very exciting activity. The International Federation of Sleddog Sports (IFSS) will be holding its Dryland World Championship in Borken,Germany, November 12-13, 2011. Mushing USA is accepting applications for Team USA. Deadline to apply is August 1, 2011. If you wish to be on Team USA, please begin planning now, especially if you wish to take a dog(s). The application is now available online. Go to the main menu, click on World Championship. You will then be linked to the page on which is the application (MS Word). Probably the best airport to fly into with direct flights from the USA is Amsterdam, Netherlands (Schipol), which is about a two-hour drive to Borken. It is a major airport. There is also a smaller airport in Dortmund, about an hour SE from Borken. Düsseldorf, Germany, is also about an hour from Borken (south). Please contact Mike Marsch, MUSA Vice President (dogdaze@badger.tds.net), or Sally Bair, MUSA Treasurer (sbair@tds.net), if you have any questions. In accordance with Article 8.3 of the USFSS Bylaws, I have the pleasure of sending you the formal Calling Notice for the 2011 MUSA Congress to be held at the in Green Bay, Wisconsin, June 25, 2011, beginning at 10:00 AM. According to this article, “The Calling Notice shall contain a request for any items which any member may wish to have included on the agenda, including proposals for Bylaw changes. Such items for the agenda are to be sent to the President or Secretary at least six weeks before the Congress.” The six-week deadline for agenda items to be sent to the President or Secretary is May 14, 2011. After May 14th, subsequent items for the agenda must be sent to the President or Secretary and should eventually be approved by the Congress. In accordance with Article 8.3.4 of the MUSA Bylaws, the Agenda will be sent to you by June 11th along with any working papers, Bylaw changes or other proposals, and résumés of nominations from the Nominating Committee. Further nominations will be accepted until June 19, 2011. In accordance with Article 11.3 (Active Athletes Council), the Active Athletes Council will hold its election meeting after the election of the Mushing USA officers (president, vice-president, secretary, treasurer) and before the election of at-large board members. This Council elects positions to the MUSA board so that the total Active Athletes representation is at least five (5) of the MUSA Board. Team USA came home from the IFSS World Championships in Norway with feelings of gratitude and an appreciation of the camaraderie and learning that comes from competition that offers the best in the sport. The sled long distance events took place in Røros, Norway, February 3-10, under the auspices of the Femundlopet, and the Nordic and sprint events were held in Hamar and Holmenkollen March 18-27th. Temperatures in all of the venues were warm. However, the terrain of the Femundløpet long distance race site saw temperatures drop during nights and in more mountainous areas and winter storms brewing. The first day at Hamar experienced snow, but subsequent days were sunny with temperatures in the upper 30’s and lower 40’s. Holmenkollen temperatures were also very warm. Rachael Scdoris (Oregon) competed in the Long Distance 400k in Røros, the only American entered. In a line-up that sent off over 150 teams from the start line, she finished 72nd. Already a veteran of Alaska’s Iditarod, she was happy with the performance of her borrowed team and is glad to have this race under her belt. Simply finishing such a grueling race is an honor. And for a gal who is legally blind, it is an accomplishment to be proud of. There were plenty of rough spots along the trail, but she is grateful to the organizational skills of the Femundlopet and IFSS for making the race a success. John Thompson (Minnesota) was the first America to take to the trail in the Nordic events, skiing to a 4th place finish in the Nordic men’s skijoring 2-dog race. He was just 14 seconds off the pace for a bronze medal, having lost time (15 seconds?) in the start chute the second day due to icy conditions when donning his skis. Thompson also competed in the 17k 1-dog men’s skijoring, but took a wrong trail and had to drop out of the competition. Competing in Norway was a dream come true for him, and he relished every minute of it. Rebecca Knight (Alaska) placed overall 10th in the Nordic women’s 2-dog skijoring. Competing in Norway at such a prestigious event as the World Championships was a dream come true for Rebecca, and where she finished was not important. Getting her two dogs to Norway provided for some hectic moments, but all in all, she enjoyed every minute in Norway. Celebrating her 50th birthday in Norway brought special meaning to the trip. But there is sad news, too, for her nine-year-old dog, Gypsy, raced her final race, and Rebecca will be retiring her. Janet Saxon (Colorado), competing at Holmenkollen in the Nordic women’s 1-dog skijoring, came in last, but, she commented, “We were just slow in our race, and Barclay was a bit timid throughout the whole course, and decided not to work very hard! I had a great experience regardless, and had no expectations going into it - so all was good.” Knight and Amy Cooper (Wisconsin) also competed in the Nordic women’s 1-dog skijor, placing 20th and 21st out of 23 teams. Like Rebecca, Janet and Amy learned a lot and were happy to be at the World Championships regardless of how they did. Jason Sperry (New York) and Scott Aimone (Colorado) competed in the Nordic men’s 1-dog skijoring, placing 16th and 21st, respectively, out of 23 finishers. These two able athletes also entered the Nordic men’s combined (combining the pulka and skijoring), placing 13th and 15th respectively. Young, 15-year-old Alexandra Vedeler, running for Team USA, took home a gold in the junior sprint 4-dog. She lives in Norway, where her parents are her best handlers and supporters. She wants to be as good as her idols: Hege Ingebrigtsen, Lena Boysen Hillestand, Venke de Lange and Nina Skramstad. “They are sooo good with the dogs,” says Alexandra. She thinks it is exciting to be a contestant in the same competition as some of her idols. Eighteen-year old Dillon Gast (Vermont) turned in a splendid performance in the sprint unlimited competition. His first day was his worst, and he had to drop a dog because its health papers did not comply with the rabies titration requirements. However, on day two he came up from 9th to a day time of 5th. On day three, he had the 6th fasted time, placing him overall in 7th. He has been training with Uli Kuehn (Germany) since July and ran his dogs. He plans to stay on with Uli until this summer. He will be bringing home a virtual encyclopedia of knowledge. Dillon also competed in the junior men’s 1-dog skijoring, placing 8th. Dillon is truly an all around mushing athlete! Mushing USA thanks these athletes for their contribution and dedication. They are worthy representatives for the USA. They did us proud. December 6, 2010, Monticello, MN – Mushing USA (MUSA), the national governing body of sled dog sports in the USA, has made its final selection for competitors to represent the USA in the IFSS (International Federation of Sleddog Sports) Winter World Championships in Norway in February and March, 2011. The Long Distance events will be in February in Røros, and the Nordic and sprint sled classes will be in March in Hamar and Holmenkollen, near Oslo. Some of these competitors will be transporting their own dogs to Norway, and some will be borrowing dogs from Europeans. Dillon Gast has been training in Europe this past winter and will be competing with Uli Kuhn’s (Germany) dogs. Jenna Dittmar is living in England this year and looks forward to possibly having a few of her own dogs flown from USA but otherwise borrowing dogs from a Norwegian musher. Rachael Scdoris will be leasing a long distance team from Ketil Reitan of Norway but will be transporting her own leaders, Breeze and Wrinkles. Each musher will receive a monetary stipend from IFSS for travel and transporting dogs from the USA to Norway. Many of the athletes are also being sponsored by private companies and individuals. Long distance competitor Rachael Scdoris, after competing in the Iditarod, is amazed at how few people realize that sled dogs even exist outside Alaska. “Competing in and promoting the Femundlopet would give me one more tool to peak peoples’ interests in sled dog sports.” As a legally blind person, she will be competing with the adaptive aid of a companion team from Ketil Reidar’s kennel. One of the young members of Team USA is Jake Robinson, who says, “I will be able to fulfill a life-long dream as well as share my experience with others as I promote the wonderful sport of mushing.” He is also a previous IFSS champion, having earned a first place finish in the IFSS 2009 Daaquam (Quebec, Canada) World Championships in the Junior 1-dog skijoring class. Katie Harris reflects on her 2009 Daaquam IFSS World Championship, where she was amazed at “seeing all the competitors from all over the world, and getting to race against the best. I had never even been out the USA, and here I was getting to have dinner with the Norwegian team, learning about dog sledding in Jamaica, and getting to see classes I had only heard about, like pulka. I was proud of my team’s performance, but at the same time I came home with plenty of ideas on how we could do better. I learned a lot in Daaquam that I could bring back and share with others.” She anticipates bringing home more learning tools and friends from Norway. These worthy representatives of the USA all look forward to going to Norway and mixing with and learning from their peers from all over the world. Some will be spending some extra time traveling (and maybe some shopping?) and taking in the sights that such a beautiful winter wonderland presents. MUSA congratulates these elite athletes and knows that they will be worthy representatives of the USA in competition against the many outstanding competitors from throughout the world. MUSA wishes them the very best fortune and looks forward to their tales from the trails of Norway. USFSS has extended the deadline for submitting applications for entry to the World Championships this winter in Norway from September 15th to October 1st. Application for entry is online at the Mushing USA website (www.mushingusa.org>Competition> Competition Entry Form). Anyone wishing to compete in the World Championships must complete an application even if they have received an automatic berth. Those not having been granted an automatic berth will have their application evaluated and prioritized by the MUSA Selection Committee. Competitors will be notified of their selection by November 1st. In partnership with Mushing USA, Skijor USA will be hosting an USA National Skijoring Championship race on February 5th and 6th 2011. The nation's top skijorers will compete in Minneapolis, MN for national titles in one and two dog skijoring. A third title - combined skijoring - will be awarded to the skijorer who posts the fastest combined time over the two days of racing. Women and men will compete separately, and the purse will be divided equally between the classes. Skijorers outside the USA are encouraged to race and will be eligible for all cash prizes (national titles awarded to top American finishers only). The two-dog race will consist of two laps around Lake of the Isles in Minneapolis with a finish on the snow-covered streets of the trendy Uptown neighborhood. Race distance will be 7.5k and one or two dogs are permitted. The one-dog race will be held on the hilly Junior Olympic course in Theodore Wirth Park in Minneapolis. Race distance will be 14k and only one dog is permitted. To be eligible for the combined title, a skijorer must use one of the same dogs raced in the two-dog event the previous day. Racers must agree to possible drug testing. Both races are being held in conjunction with the City of Lakes Loppet (cityoflakesloppet.com). Last year the City of Lakes Loppet and race director Kevin Murphy organized the world's largest skijoring event with over 120 participants. Final details including purse size, online race application and contact information will be available online at the Skijor USA website at www.skijorusa.org. Monticello, MN – Applications for Team USA participation in the 2011 IFSS World Winter Championships in Norway are now open. They can be downloaded in MS Word by going to Mushing USA’s website (www.mushingusa.org) and clicking on “Norway 2011 WCh” on the main menu at the left. Anyone wishing to compete in the World Championships must complete an application even if they have received an automatic berth. Those not having been granted an automatic berth will have their application evaluated and prioritized by the MUSA Selection Committee. Applications are due to MUSA by September 15, 2010. Final selections to represent Team USA will be made and competitors notified by October 10, 2010. Funäsdalen, Sweden, 15 May, 2010 – IFSS (International Federation of Sleddog Sports) has scheduled a two-day training seminar for prospective Doping Control Officers (DCO) and Assistants (DCA) as well as National Anti-Doping Officials for Monday and Tuesday, September 27-28, 2010, in conjunction with its General Assembly to be held near Dublin, Ireland, September 25-26, 2010. All interested persons are welcome to register for this Anti-Doping seminar. However, participation is limited to twelve persons, and reservations must be made to the IFSS Anti-Doping Chair Person, Carin Ahlstedt, at antidoping@draghundsport.se as soon as possible and at the latest by September 1st. The participants will then receive a list of documents, mainly from the WADA website, which are to be studied in preparation for the training seminar. Interested persons are also requested to copy email IFSS Secretary General, Sally O’Sullivan Bair (sbair@tds.net) with their reservation. The seminar itself is free of charge, but accommodation and travel are at the expense of each Federation/participant. The trainer will be Carin Ahlstedt, official DCO trainer for IFSS. The training will conclude with a written test, which is required for those who wish to gain IFSS DCO certification. Candidates who pass the exam must officiate as a DCA at, at the minimum, one approved race event and, preferably under two different DCOs, and upon recommendation from these DCOs, may then apply for an IFSS DCO certificate. In the near future each Federation will be obliged to report on Doping Control of Dogs at minimum in connection with their National Championships and International Events and also report educational work aimed at both athletes and race judges. This means that each Federation – or a group of Federations together in a Region – must nominate both an Anti-Doping Official (Contact Person) and at least one Doping Control Officer (DCO) for Dogs to be able to meet these obligations. From the beginning those two positions may be held by the same person as human resources may dictate. However, as soon as possible, each Federation – or each Region – should have different people in the two positions for Results Management reasons. Carin Ahlstedt is also willing to offer her services to come and hold training seminars on a national or regional basis as well, possibly together with some of the other already certified DCOs, if they get travel and accommodation costs covered by the organizer. However, offering this training seminar in conjunction with the IFSS GA will hopefully provide the opportunity to coordinate the Anti-Doping Education and attendance as a delegate at the GA.
Monticello, MN – The Council of the IFSS (International Federation of Sleddog Sports) has approved the tentative schedule of events for its Winter World Championships (WCh) in Norway, 2011. MUSA will soon open up the application process for Team USA. To get the schedule, please click here for a downloadable PDF. Oxford, Maine – Mushing USA, the national governing body of sled dog sports in the USA, has appointed three members to its Anti-Doping Committee. Previously appointed as chairperson was Sally Bair, the Secretary General of the International Federation of Sleddog Sports (IFSS) and member of MUSA’s Board of Directors. Serving with Bair will be Jerry Vanek, Donna Davis, and Diane Locotos Stewart. Donna Davis is a pharmacist (Duluth, MN) who is also a musher. Jerry Vanek (Angus, MN) is a former musher. Also a veterinarian for such major sled dog races as the Iditarod, he is certified by the ISDVMA – International Sled Dog Veterinary Medical Association. Diane Locotos Stewart (Ipswich, MA) is a chemist and musher. All are very qualified persons with impressive résumés. Each national sports federation is required by the mandates of the World Anti-Doping Agency (WADA) to set up its own anti-doping committee. Presently, the work of the Mushing USA committee is only minimal, primarily in the sphere of keeping abreast of any new developments in the world of doping control for both people and dogs. It is required to provide all Mushing USA athletes with anti-doping education so that they know their rights and responsibilities with regard to doping control and the principles of the Anti-Doping Code. Currently, one of the barriers to more work is the USA Anti-Doping Agency's hefty price for granting TUEs (Therapeutic Use Exemptions). Dogs do not need TUEs. When the International Olympic Committee (IOC) and WADA can sort out the TUE issues, there will gradually accrue more involvement of MUSA’s Anti-Doping Committee. This will include carrying out and following all the procedures for drug testing in the USA for MUSA-sponsored competitions such as regional or national championships. Mushing USA is pleased to have such an auspicious team on its Anti-Doping Committee. Oxford, Maine – The International Federation of Sleddog Sports (IFSS) has announced its selection for a training camp to be in Sweden at the end of February, 2010. Two skijorers from the USA will be attending: Jason Sperry (New York) and Jim Benson (Minnesota). The primary goals of the camp are to improve the abilities and performance of those wishing to compete in the Nordic disciplines at the IFSS World Championships in Norway in 2011 and to give the training camp participants the skills and tools to enable them to go back to their own countries and educate others, further helping to develop skijoring and pulka. Like Sperry, Benson is an experienced skijorer but has never competed internationally against the best of the best. He has developed a training curriculum that is currently being used by his local Minneapolis club, the Midwest Skijorers Club, of which he is currently president. The Scandinavian training camp “is a very unique opportunity to further broaden the spectrum and depth of our training venues for the benefit of the sport and participants at all levels,” Benson commented upon learning of his selection. Both Sperry and Benson as also anxious to develop their skills in Nordic pulka. They are both also looking forward to competing in the 2011 IFSS World Championships in Norway and are grateful to IFSS for giving them the opportunity to further their skills in such an auspicious venue as the training camp. In all, there will be twelve participants in the camp, selected from all over the world among thirty-three, very qualified applicants. Benson and Sperry are proud to have been selected. The Mushing USA Board of Directors passed a resolution at the June, 2009, Congress that states that IFSS World Cup points will be used for part of the selection process for Team USA for IFSS World Championships. What does this means for anyone wishing to go to the 2011 WCh in Norway? Although final selection criteria are not yet established and ultimately must be approved by the Mushing USA board, it would behoove any prospective 2011 Team USA athlete to compete in at least one 2010 IFSS World Cup event in the class in which he/she wishes to be accepted for 2011 Norway WCh Team USA. Be aware that Race Giving Organizations (RGOs) are not required to accredit every class that is eligible for accreditation. They may pick and choose. IFSS has set aside $10,000 to help defray travel expenses to Norway for those traveling from overseas. How this money will be allocated is yet to be decided by the IFSS Council. In the past it has been based on a set amount for the musher and an amount per dog (up to a limited number of dogs). Sign up now as an IFSS World Cup Event for 2009-2010! Winners qualify for IFSS 2011 World Championships in Norway! What is IFSS World Cup? The IFSS World Cup Series offers a worldwide ranking system for mushers. It provides opportunity for promotion of mushing and mushers and welcomes participation from race giving organizations (RGOs) in each class from all regions of the world. Entry into the World Championship is in part based on a competitor’s World Cup ranking for the past year. The first three finishers in the 2010 World Cup in each class in each region will automatically be awarded a World Championship berth for the World Championship to be held in Norway in 2011. In addition, medalists in the 2009 IFSS World Championship in Daaquam (Canada) will be eligible to enter in the same class. Each country is also entitled to three berths in each sprint and Nordic class in the 2010 World Championship in Norway. However, there is no limit to the number of entries into the mid-distance and long distance classes. Criteria for selection of the teams is up to each IFSS National Federation (IF). 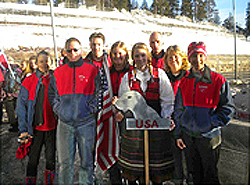 Mushing USA has set World Cup ranking as part of its criteria for Team USA 2011 Norway. IFSS, together with the 2011 host, the Norwegian Sleddog Federation (NHF), will also be offering travel money to help defray costs for those competitors traveling from overseas to Norway. South America has already staged its Continental Championships in both dryland and snow, and snow races are around the corner in the northern hemisphere. Offer your USA mushers a part of the action in Norway! for the World Cup application and information. Saguenay (Quebec) Canada – Four inches of slushy snow on Tuesday before the start of the IFSS (international Federation of Sleddog Sports) World Championships didn’t deter race organizers from having a superb trail at Saguenay (Quebec) Canada. Snow crews worked hard to clear the trails of the white cover prior to the race start. The event took place over four days, from October 29 through November 1, 2009, in the LaBaie District of Saguenay (Quebec) Canada. The Bec-Scie Center in Saguenay hosted the four-day event. The nature center is named after a hooded merganser duck that inhabits this river area. Approximately 100 teams from Poland, Russia, Switzerland, Norway, Canada, France, and the USA vied for medals in the twelve classes. The first day’s events saw cloudy skies with a temperature of about 40° F (4.4° C). Scooter 1-Dog class, Bikejor, and 4-Dog Cart classes wrapped up on Friday, October 30, after two days of competition. The day was overcast but remained relatively cool, in the range 4 to 6 degrees Celsius. The trail was damp and some sections were quite muddy. Saturday began the Canicross, 2-Dog Scooter, and 6-Dog and 8-Dog Cart classes. Warm temperatures and intermittent rain showers greeted competitors. Cart classes were delayed and their course shortened due to temperatures being too warm. Saturday was capped with a Halloween dinner and dance with live music. Crazy clowns from Team Canada stole the show and got everyone onto the dance floor. The sun shone on Sunday and cooler temperatures prevailed. Competitors and spectators alike enjoyed the mass start Canicross relay, which was won by Poland. Poland and Norway dominated many of the classes, but USA teams made respectable showings in the 4-Dog Cart class where they copped silver (Jessica Doherty) and bronze (Liz Bailey) medals. Brittany Colbath picked up a bronze on the Women’s Senior Bikjoring class, and Ed Clifford and Fred Derksen earned gold and silver, respectively, in the Veteran Men’s Bikjoring class. Clifford also took home a gold in the 8-Dog Cart, with Josh Mercure winning a bronze in the 6-Dog Cart class. Christina Dawn Eagle glided to a 2-minute win in the Women’s Senior Canicross class, while Liz Bailey managed another medal, a bronze, in the same class. Diane Locotos took home the gold in the Women’s Veteran Canicross. The Canicross Relay team of Liz Bailey, Jason Sperry, and Christina Dawn Eagle picked up the silver medal. IFSS thanks the Saguenay organizing committee for its wonderful hospitality and for putting on a successful event. Complete race results are on the IFSS website (www.sleddogsport.com). Clearwater, MN – The organizing committee for the East Meets West Dryland Sleddog Race is swinging into high gear in preparation for the November 14th &15th debut in Clearwater’s Warner Lake Park. Race Coordinator Monica Jendro is excited about all that will be available to mushers and the public: “We will have a smorgasbord of concessions throughout the two days as well as a “Meet the Mushers Dinner” on Saturday evening where anyone and everyone can mix and mingle with competitors and find out more about this exciting aspect of sled dog sports.” Events will begin at 10:00 a.m. on Saturday and 9:00 a.m. on Sunday. Of course, the public is welcome to come and see for themselves as the dogs and mushers ply the trails on Saturday and Sunday. In fact, the public can even participate and get their feet wet in dryland racing by entering a canicross “Fun Run” event to be held on Saturday! All you need is a dog and a leash. If you have the specially designed canicross belt and a sled dog harness, all the more power to you! Canicross is essentially running with your dog in harness and attached to the musher via a line and a specially designed belt. However dryland racing offers a variety of new sled dog sports. Bikejoring is done with one or two dogs and an experienced musher on a suitable bike. Scootering is also done with one or two dogs and specially designed “mountain scooters.” Then there are rig races, where mushers ride a light-weight, wheeled cart pulled by a team of dogs, typically two to six. Dryland sled dog racing is a relatively new aspect of sled dog sports, but it has caught on rapidly throughout Europe and now, also in North America. Over 100 competitors from throughout North America are expected to be competing for a $10,000.00 purse in 12 classes of racing. The event is sanctioned by the International Sled Dog Racing Association and accredited by the International Federation of Sleddog Sports with collaboration by the North Star Sled Dog Club of Minnesota. Oxford, ME USA, October 17, 2009 – Mushing USA (MUSA), the national governing body of sled dog sports in the USA, has combined forces with the International Federation of Sleddog Sports (IFSS) and the Down East Sled Dog Club (DESDC) to host a dryland training camp in conjunction with the Run Dawg Run Festival at the Pineland Farms in New Gloucester, Maine, on October 24-25, 2009. This event will combine a dryland sled dog competition with dog-powered sports demonstrations and seminars on the proper care, conditioning and nutrition for pet athletes. The event vision is for a festival type atmosphere, with music, professional announcing, food and beverages along with on-site equipment vendors. Two sled dog athletes will be coming from Norway for the event and will carry the baton as instructors in the seminars and demonstrations. Lena Boysen Hillestad and Venke de Lange, both outstanding athletes in sled dog sports, especially Nordic style, will arrive from Norway in order to compete in the IFSS Dryland World Championships in Saguenay (Quebec) Canada the week after the Run Dawg Run Festival. Their presence will lend an international flavor to the Run Dawg Run Festival as well as provide valuable lessons in dog powered sports. Mushing USA extends its appreciation to Down East Sled Dog Club in hosting this event and to Sara Vanderwood, IFSS Council representative from the USA, for all the planning and hard work that has gone into staging the Festival. Melbourne, Australia, October 15, 2009 – The International Federation of Sleddog Sports (IFSS) has announced that a designated amount of money will be allocated for 12 people from IFSS member federations to attend a training camp to develop their abilities and the sleddog sport in their country and region. Only one person from each federation will be accepted. All transportation and accommodations will be paid for by the joint contributions of IFSS and the Scandinavian national federations, Norges Hundejörerforbund (NHF) and Svenska Draghundsportförbundet (SDSF). For 10 days, from 26 February to 7 March, 2010, 12 individuals will have an exciting opportunity to participate in an extensive training course, emphasizing Nordic pulka and skijoring but also including training with Nome sled, to take place in Norway and Sweden. Participants will first travel to Mora, Sweden, on February 26th and then go on to Orsa Hamar, Norway, March 4th to compete in the Trial World Championships. The purpose of the camp is two-fold: (1) to help improve abilities of international competitors who wish to compete in the IFSS World Championships in Norway in 2011 and (2) to educate and train people who can teach others in their home country or region. Practice and theory will be taught with particular emphasis on skiing technique, waxing material and organization and cooperation in sleddog sports. The training leaders will be Ulla-Kari Pontén of Sweden, who will lead in Nordic; Malin Sundin, who will instruct in long distance sled; Sara Sundin, trainer for Nordic and sled; and Bengt Pontén, IFSS president who will work with Nordic skills. Present will also be several instructors from the local sled dog club in Sweden and the Ski College in Mora. Prospective applicants are invited to apply by requesting application form and materials from Darren Watson, IFSS Vice President for Development (darrenwatson01@gmail.com) or Sally O’Sullivan Bair, IFSS Secretary General (sbair@tds.net). Completed applications must be received by IFSS (Darren Watson) no later than November 7, 2009, so that the selection process can be completed and selected participants will have time to make appropriate arrangements. June 10, 2009 - The IFSS (International Federation of Sleddog Sports) Council has approved two Race Rule changes for the Dryland World Championship in Saguenay (Quebec) Canada, scheduled for October 30-November 1. The first rule change concerns a junior class. There will now be a separate junior class in Bikejöring for ages 16-20, for men and women. The second rule change deals with rig equipment. In the Saguenay race, 3-wheeled carts will now be allowed in all rig classes. Previously, 3-wheeled rigs were allowed in only the 4-dog rig class. Other rig classes were required to have 4-wheeled rigs. The age limit for juniors in the Canicross and the 4-dog rig class is 14 years. The IFSS Race Rules (www.sleddogsport.com) do not provide for a junior class in the Scooter class and normally not in Bikejöring. IFSS cites the dangerous nature of some of the Dryland classes as reason to disallow juniors or to limit the minimum junior age to 14 or 16 years. This past spring, IFSS approved a Race Rule change to the Dryland rig classes to require a brake on only the rear wheels and no brake on the front wheels. This change came about from North American competitors and equipment makers who outfit rigs with no brake on the front wheels. Safety is not compromised by allowing rigs with no brake on the front wheels. A new addition to the Dryland rules, also approved this past spring, is the requirement that competitors in the Team Rig classes carry sufficient drop chains or cables to tether, if needed, their dogs at the dropping check points along the trail. Competitors are reminded that helmets are required for all Dryland classes except Canicross. Gloves are recommended, and competitors are advised to dress according to the weather conditions. Saguenay can get chilly and cold by the end of October. Previous Dryland World Championships have seen crews shoveling four or more inches of snow off the trails before competition could begin. Competitors are advised to check the Saguenay website for additional information (www.saguenaydryland.com), such as the schedule of events, lodging, and other important information, including information about the trails. Robert Schiesser of Koblenz, Switzerland has accepted to be the Race Marshal (RM) for the IFSS World Championship 2009 Dryland in Saguenay. Robert has the experience of the last two IFSS Dryland World Championships as RM and speaks French as well as English. The trail boss will be Ludovic Coulaux of Canada, and the Chief Veterinarian will be Christine Belley of Canada. IFSS President Bengt Pontén has appointed Bernard Pépin (IFSS Vice President of Sport) of France as the Appeals Jury Chair. Saguenay (Quebec) Canada is a city of about 200,000 population located approximately two hours’ drive north of Quebec City on the Saguenay River. It is a city bounded by fjords where one can frequently observe whales, which come in from the Atlantic Ocean through the Gulf of St. Lawrence. May 3, 2009 ? Mushing USA is extending its deadline for applicants seeking entry into the IFSS (International Federation of Sleddog Sports) Dryland World Championship to be held in Saguenay (Quebec) Canada on 30-November 1, 2009. The deadline has been extended to June 1, 2009. Canicross, bikejoring, scooter, and rig classes will be offered. In all classes, except canicross, World Champion titles will also be awarded to Registered Purebreed teams. The trails will be from 2.5 to 7.5 km (1.6 to 4.7 miles) depending on the class. Entry is open to all US citizens and US residents. Individuals wishing to enter must apply through Mushing USA. US residents who are not US citizens must apply directly to the MUSA Board. An application form, a downloadable MS Word document, is on the MUSA website at www.mushingusa.org > Competition > Competition Entry Form. Entry fees are US $50/class for senior and veteran classes and US $30/class for Junior classes. Applications must be received from prospective entrants by June 1, 2009. Those accepted for entry will be announced on June 27, 2009, at the MUSA Congress in Sault Ste. Marie, Michigan, with personal contact to follow. Acceptance of the invitation and payment of all applicable fees by entrants must be completed by August 15, 2009. April 15, 2009 – Mushing USA is seeking applicants for entry into the IFSS (International Federation of Sleddog Sports) Dryland World Championship to be held in Saguenay (Quebec) Canada on 30-November 1, 2009. Applications must be received from prospective entrants by May 15, 2009. Those accepted for entry will be announced on June 27, 2009, at the MUSA Congress in Sault Ste. Marie, Michigan, with personal contact to follow. Acceptance of the invitation and payment of all applicable fees by entrants must be completed by August 15, 2009. April 1, 2009 – Mushing USA (MUSA) is pleased to announce that its regular biennial Congress will be held June 27-28, 2009, in Sault Ste. Marie, Michigan, at the Quality Inn & Suites Conference Center* located just off the Interstate 75 and only five minutes from Lake Superior. MUSA has reserved a block of 10 rooms (each with a double bed) for its members. There are at least 4 vacant positions on the MUSA Board, and anyone interested in becoming a candidate or nominating someone for these positions may submit his/her résumé to MUSA secretary Debbie Serbousek (windigo@cheqnet.net, #715-372-8889). All nominations must be submitted prior to the Congress, by June 19th. Any members wishing to have items included on the agenda, including by-law changes, must submit these to secretary Debbie Serbousek by April 13th. The final agenda and any working papers will be circulated to members by May 25th. The MUSA Congress will coincide with ISDRA’s annual meeting to also be at the Sault Ste. Marie Quality Inn. MUSA members are invited to sign up and pay the appropriate fees for ISDRA activities or banquets. Go to www.isdra.org for more information on the ISDRA meeting. March 10, 2009 – The International Federation of Sleddog Sports (IFSS) has approved the city of Saguenay (Quebec) Canada, as the site of the 2009 IFSS Dryland World Championships. The event will take place October 30-November 1, 2009. Saguenay is located on a fjord, roughly a 2 hours’ drive north of Quebec City along and inland from the St. Lawrence Seaway on the Saguenay River. It is a city with a population of 150,000. The race site chosen is the Bec-Scie outdoor center in Saguenay where the Defi de la Mars race on snow is organized in the winter. Various lodging facilities are available in the city of Saguenay, and many tourist attractions can be seen in the area. Both cell phone and WiFi are available throughout the city and at the race site. • Rig 4-dog, 4-dog juniors, 6-dog and 8-dog. In all classes, except canicross, World Champion titles will also be awarded to Registered Nordic breed teams. The trails will be from 2.5 to 7.5 km (1.6 to 4.7 miles) depending on the class. The trails are hilly, dirt tracks mainly in the woods. Individuals wishing to enter must apply through their respective IFSS national federation member. Entry fees are US $50 for senior and veteran classes and US $30 for Junior classes. The USA national federation is Mushing USA (MUSA). Application is open to any USA citizen wishing to enter. Exception to US citizenship will be made on an individual basis by direct application to the MUSA Board. Selection of all entrants will be based on an individual’s past record. Application may be obtained from MUSA secretary Debbie Serbousek (windigo@cheqnet.net). Applications must be received from prospective entrants by May 15, 2009. Those accepted for entry will be announced on June 27, 2009, at the MUSA Congress in Sault Ste. Marie, Michigan, with personal contact to follow. Acceptance of the invitation and payment of all applicable fees by entrants must be completed by August 15, 2009. November 15, 2008 – Mushing USA (MUSA), the national governing body of sleddog sports in the USA, is proud to announce its selection of entries into the 2009 IFSS (International Federation of Sleddog Sports) World Championships in Daaquam, Quebec Canada, January 17-25. Sprint Unlimited: Keith Bryar, Ed Clifford, Randy DeKuiper, Arleigh Reynolds, and Ben Thomas. Sprint 8-Dog: Dawn Brown, Keith Bryar, Randy DeKuiper, Rob Downey, Jerry Mulvey, Jennifer Payne-Sterling, John Perry, and Bruce Swan. Sprint 6-Dog: Brittany Colbath, Christine DeKuiper, Katie Harris, Josh Mecure, Jennifer Payne-Sterling, John Perry, Jennifer Probert, Michael Previs, and Beverly Stevens. Sprint 4-Dog: Heather Brannen, Brittany Colbath, Jessica Doherty, Stephanie Dwyer, Katie Harris, Jennifer Probert, Sadie Theriault, and Kim Wells. Nordic Men 1-Dog Skijor: Scott Aimone, Ed Clifford, Fritz Howard, Tim McMahon, Jason Sperry, and Josh Tesch. Nordic Men Pulka 1-Dog: Scott Aimone and Jason Sperry. Nordic Men Combined (Skijor & Pulka): Scott Aimone and Tim McMahon. Nordic Women Skijor 1-Dog: Kirsten Ballard, Stephanie Dwyer, Betsy McGettigan, Erin Sperry, Sara Vanderwood, and Rebecca Voris. Nordic Women Skijor 2-Dog: Heather Brannen, Kriya Dunlap, Pam Hahler, Betsy McGettigan Sara Vanderwood, and Kim Wells. Nordic Women Pulka 1-Dog: Rebecca Voris. Nordic Women Combined (Pulka & Skijor): Sara Vanderwood and Rebecca Voris. Sprint 4-Dog: Rachael Colbath, Alex Downey, Dakota Schlosser, Josh Schlosser, and Alex Thomas. Sprint 2-3 Dog: Moses Mulvery, Aisling Shepard, and Lily Stewart. Nordic Women Skijor 1-Dog: Sadie Theriault. Nordic Men Skijor 1-Dog: Dillon Gast and Jake Robinson. The events will take place on the site of the business enterprise Villégiature et Pourvoirie Daaquam along the Daaquam River located in the village St-Just-de-Bretenières, in the tourist region of Chaudière-Appalaches, which is about a two-hour drive southeast from Quebec City. Trails used for the competitions pass through the Appalachian Regional Park. This is an area of enchanted landscape, with large spaces of traditional North American tundra relief, including iced lakes and rivers and snowy trees in the Boreal forest. Over 200 teams from five continents are expected to be competing, and Mushing USA wishes its elite representatives “good mushing” on this prestigious occasion. Max Vidal, heading up the Daaquam Organizing Committee, is excited about the momentous event and is planning a full schedule of activities, commencing with the Opening Ceremonies on Friday afternoon, January 16. More information can be found on the Daaquam website at www.daaquam2009.com/english/menu.html. January 9, 2008 – Mushing USA, the National Governing Body for sled dog sports in the United States will use Regional Qualifying races to select participants to represent the USA in the 2009 IFSS Sprint and Nordic World Championships slated to be held in North America. The Mushing USA Board of Directors unanimously approved a proposal to use 4 regional qualifying races to select participants to represent the US at the 2009 IFSS World Championships. The proposal divided the United States into 4 geographic regions; the East, Central, including Michigan, the West, including Colorado, and Alaska. Existing races in each region were approached about acting as the regional qualifier. Races were chosen based on performance history, likeliness to be contested and competitive nature of the race. The races will contest 4, 6, 8 dog and Unlimited (Open) Sprint as well as men’s and women’s 1 and 2-dog Skijoring. If a region does not contest a class, Mushing USA will not select a representative from that region. Winners of each qualifying race will be eligible for selection to the 2009 Mushing USA Team. Because IFSS rules allow each national federation to enter only 3 people per class, Mushing USA will select only 3 of the 4 regional winners. Final selections will include the 3 winners beating the greatest number of teams in the qualifying races. However, Mushing USA is currently in negotiations to allow all four regional winners to compete. In instances where a first place musher declines their berth the 2nd place participant becomes eligible for selection. 2nd place mushers may also become eligible if a winning musher has already won another regional qualifying race. Athletes must compete in the World Championships in the class they qualified for. Competitors do not have to compete in the region in which they reside. In the East, Jackman, Maine, will be hosting the Regionals March 7-9, 2008. Classes approved are the Sprint Unlimited (Open), 8, 6 and 4-dog Sprint and men’s and women’s 1 and 2-dog Skijoring. In the Central region, Frazee’s Third Crossing Rendezvous will be one of the hosts. Running on January 25-26, 2008, it will have Regional Qualifying events in Sprint Unlimited (Open) class, 8, and 4-dog Sprint. Land O’ Lakes (Wisconsin) will host the 6-dog Sprint class for the Central region on February 2-3, 2008. The men’s and women’s 1 and 2-dog Skijoring events will be contested by the Snowflake Skijoring Classic on March 1-2, 2008, in Duluth, Minnesota. Granby, Colorado, will play host to the West Regional Qualifier on February 16-17, 2009 at its 29th Annual Grand County Sled Dog Classic. Regional events will be the 8, 6, and 4-dog Sprint as well as men’s and women’s 1 and 2-dog Skijoring. There will be no Unlimited (Open) event in the West. Alaska’s North American Championships have been designated to host the MUSA Regional Qualifiers for Alaska. The Limited North American, with the 8, 6, and 4-dog Sprint and the men’s and women’s 1 and 2-dog Skijoring classes will take place on March 7-9, 2008, in Fairbanks. The (Unlimited) Open North American will be held on March 21-23, 2008, in Fairbanks. Three venues have submitted bids to host the 2009 IFSS World Championships: Anchorage, Alaska, Daquaam, Quebec, and Cedaredge, Colorado. IFSS will be making its decision soon between these three cities. For athletes unable to compete at one of the regional races or who fail to win, IFSS also awards berths to the top three World Cup point earners in each region in each class. The United States is one IFSS region. Points are based on the competitors 6 best World Cup accredited heats. These berths do not count against the national federations allotment and will have no bearing on the Mushing USA Regional Qualifiers. For more information contact Sara Vanderwood at pulka4u@yahoo.com or Jason Sperry at sperryjg@yahoo.com. July 17, 200 – Mushing USA, the national governing body of sled dog sports in the US, held its organizing congress in Marquette, Michigan, July 14, 2007. Among business accomplished was the approval of the bylaws, election of officers and board of directors, creation of standing committees, and the establishment of goals for the next year. Elected as officers were Sara Vanderwood (Maine) as president, Mike Hutchens (Michigan) as vice-president, Debbie Serbousek (Wisconsin) as secretary, and Sally O’Sullivan Bair (Minnesota) as treasurer. Bud Rice (Alaska) was elected as past president. Sara Vanderwood continues in her appointment as the USA representative to the IFSS (International Federation of Sleddog Sports) council. These five comprise the MUSA Executive Committee of the Board of Directors. Elected to the MUSA Board of Directors as Active Athlete Directors were Dennis Marksteiner (Wisconsin), Jason Sperry (New York), and Paul Therriault (Maine). Elected as At-Large Directors were Sally J. Dawson (Ohio), Lloyd Gilbertson (Michigan), Mike Marsch (Wisconsin), and Hilary Schwafel (Alaska). Because of the staggered terms for directors, three board positions will not be filled until the next MUSA Congress in 2009. Four standing committees were approved. They are: Development (Sally Bair, chair), Legal Affairs (Mike Marsch, chair), Recreational Program (Dennis Marksteiner, chair), and Competition Programs (Mike Hutchens, chair). Each committee chair discussed possible goals for the upcoming year. Among the goals presented were developing kits for sponsorship and legislative action, setting selection criteria for USA representation to the IFSS World Championships, and establishing a program for recreational mushers based on accomplishment and participation rather than solely on competition performance. Discussion also ensued regarding designing a package for bidding for major race sites/hosts, such as a national or regional championship. Lloyd Gilbertson was the keynote speaker for Saturday evening’s dinner. He presented an anecdotal history of his mushing career, which has spanned over 40 years. He ended his commentary with his vision for the future of the sport. Mushing USA, formerly known as the United States Sled Dog Sports Federation, traces its roots to 1988. 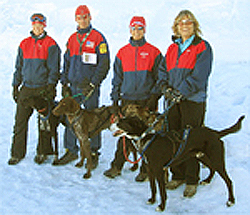 It was reformed in 2001 under its new name and incorporated in the state of Alaska in 2003 as Mushing USA. MUSA is a non-profit (501 C3). Questions may be emailed to MUSA Secretary, Debbie Serbousek (windigo@cheqnet.net). February 15, 2007 – Mushing USA, the national governing body of sled dog sports in the US, will hold its organizing congress in Marquette, Michigan, the weekend of July 14-15, 2007. This exciting event will take place at Marquette Mountain Chalet, and sessions will convene on Saturday morning at 10:00 AM. The weekend will include a Saturday evening banquet with keynote speaker Lloyd Gilbertson, whose trophies and distance race conquests are legendary. He is the 2006 winner of the prestigious Yellowknife Sled Dog Derby. More recently, Wendy Davis, driving a team from Lloyd’s kennel, swept the competition at the 2007 Wyoming Stage Stop Race. To enable prior input into the 2007 organizing congress, MUSA anticipates having an established agenda. “Working papers,” which will include all proposals and other information, will be sent out via email or be available on the MUSA website before the congress for anyone interested in participating either in person or via another means. Anyone can give feedback on these proposals or submit proposals themselves. In order to attend in person, one must be a member of Mushing USA or a representative from a club that is a MUSA member. A membership application is online at www.mushingusa.com. Marquette Mountain Chalet will provide meals at a nominal cost, which will be included in the registration fee, but attendees will be expected to provide their own lodging at other venues in Marquette. Registration materials and the working papers will be available online at www.mushingusa.com. Mushing USA, formerly known as the United States Sled Dog Sports Federation, traces its roots to 1988. It was reformed in 2001 under its new name and incorporated in the state of Alaska in 2003 as Mushing USA. Non-profit (501 C3) status has been filed for and is pending. The mission of Mushing USA is to promote, support, coordinate, and develop mushing activities in the United States, to promote and encourage the welfare of the sled dog athlete and to foster appreciation for the traditions and history of the sport. As the national governing body of sled dog sports in the United States, Mushing USA is further committed to the ideals and guidelines of the US Olympic Committee. It is the USA representative to the International Federation of Sleddog Sports (IFSS) and is the selection body for sending US teams to compete in IFSS World Championships. Questions may be emailed to Sally O’Sullivan Bair (sbair@cpinternet.com).